Gente, I am so darned excited about these upcoming shows with my friend Denise. She has come all the way from Brazil, her first time in some of these cities, so let’s give her a great big welcome! If you can’t join us for this unique collaboration, you can still get a taste for what is coming by viewing the videos below – which include her incredible ‘voice trumpet’ skills, plus a video of us drinking cachaça in Rio de Janeiro (where I unfortunately speak broken Portuguese with an Italian accent… I’m still learning!). See you soon. A chance encounter between Avi Wisnia and Denise Reis at a New York City open mic in 2010 resulted in friendship and collaboration. The two artists discovered musical affinity in the influence of Brazilian music and the desire to craft exciting original songs. 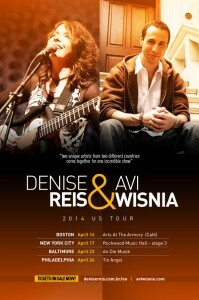 After a successful run of shows performing together in Rio De Janeiro, Avi and Denise decided to bring their collaboration back to the US where it all began, with the pure and simple purpose of sharing the possibilities of music that transcends boundaries and fuses language and culture. Posted Tuesday, April 8th, 2014 under Uncategorized.